Finally, the moment you have all been attentively waiting for. If you walk up to someone and say "Orson Welles," it's obvious the first thought that will come to their mind is Citizen Kane. Orson Welles debut film was Citizen Kane, and in fact it's considered by most people to be the greatest Orson Welles movie ever and AFI (America Film Institute) has it as the greatest movie of all time. As long as I'm on the topic of Citizen Kane and movie rankings, the leading movie ranking program, Sight and Sound has considered Citizen Kane to be the best film of all time for awhile. Sight and Sound bases it's ranking off several of the most highly respect film critics. Now, just in this year, 2012, Citizen Kane has finally met it's demise and has been bumped out of the position of first place into second place. What replaced Citizen Kane? Citizen Kane was replaced by Alfred Hitchcock's originally-hated-now-considered-a-masterpiece, Vertigo. Let me give you some information about the release of Citizen Kane. Put yourself into the year 1939, Orson Welles has just been given a contract with production company RKO Pictures. Orson Welles' sudden success was based off the fact that in 1938 he had gone on the radio on April Fools and done a radio announcement version of H.G. Welles' "War Of The Worlds". A majority of the American population were fouled by Orson Welles' clever manipulation. Now, Orson Welles RKO contract gave him the right to direct, produce, write and act in two feature films. As well, he was allowed to cast whoever he wanted and he was given the privileged of the final cut. This meant that unlike several other movies, Orson Welles would not have to send his movie into RKO for them to cut it down for the final cut. However, this doesn't make to much of a difference since they still cut down approximately half of Orson Welles' follow-up movie to Citizen Kane, The Magnificent Ambersons. Cut to a year later, here is where we introduce a key character in the production of Citizen Kane. Herman J. Mankiewick is a fairly successful screenwriter. He gets himself into an dismaying car accident. Now, Herman J. Mankiewick had worked with Orson Welles in the past on a radio program. 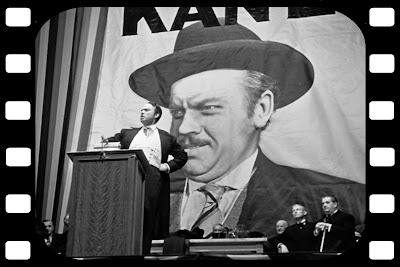 Orson Welles pitched the idea of Citizen Kane to Mankiewick who agreed with Welles, it was a genuinely genius idea. There was one problem. Mankiewick wouldn't be able to write Citizen Kane since he was in the hospital. Together they worked, trying to think of who their main character would be. They both agreed, it should be based on a real person. John Dillinger came up into the discusion, but Orson Welles did not particularly favour the idea. Then William Randolph Hearst was though of. He was a famous newspaper man who's fame and success went to a very high degree. His private life become the front page on every newspaper, including his own. There was their idea. Makiewick and Welles worked together in the hospital room to create one of the most iconic movies of all time. Orson Welles began to shoot Citizen Kane. It's said that while he was shooting the movie, Orson Welles watched John Ford's Stagecoach forty times. Why did he watch Stagecoach such a so many times? That's a question Orson Welles never answered. Personally, I haven't the fainest idea. That's another reason Orson Welles is far superior than most directors. Cut to after Orson Welles has just hit theatres. Critics are going insane, it's genius! How could such shots never have been though of before? This is the first interactive camera. At that point most films were linear. Most cameras sat in the corner and showed the events through dialog I believe Orson Welles was heavily influenced by German director, Fritz Lang. What Fritz Lang and Orson Welles have in common is the way they use their camera to tell a story. For those two directors (especially Lang) a camera angle tells more than fifty lines. Anyway, here we are, Orson Welles is enjoying his films critical success. However, nobody is enjoying what the audience is thinking about Citizen Kane. People who went to Citizen Kane did not like it, they thought it was boring. They didn't like how it re-invented everything they'd ever seen when they went to the movies. People want change to be gradual, they didn't like it to be sprung upon them. Cut to the Academy Awards ceremony. 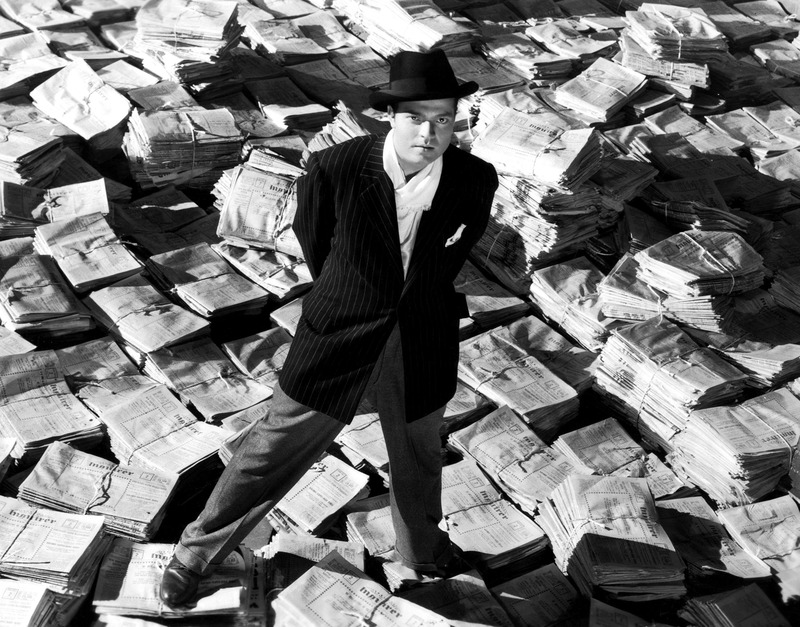 Citizen Kane has been honored with nine nominations. Whenever Citizen Kane was brought up in the Academy Awards ceremony the audience delivered a massive "boo". What are these influence of Citizen Kane I've been speaking of for most of this article? We go into deep intensive focus when things are in the background, mid-ground and foreground. Our camera can cut from looking up at a character from the angle of their shoes to a shot where the camera is being held by a crane. Everything in Citizen Kane is shot in shadow, which leaves us with some classic eerie cinematography. Why is Citizen Kane such a classic movie? It was just so innovative. You think movies as you know them would be the same without Citizen Kane? Guess what, you're wrong. Earlier I refereed to how Sight & Sound finally bumped Citizen Kane down one notch. It's not as though Citizen Kane isn't as good as movie, what's happening is everything that was so innovative at the time has blended in and been used by every single modern director. The older Citizen Kane gets, the less respect people see it for the first time will feel. Honestly, that's quite tragic because Citizen Kane is a great movie. Also, this was one of the first major hits to have a surprise ending. I won't say anymore, however I will certainly spoil the ending later on in this review. That means, if you have not seen Citizen Kane, for heaven's sake, DO NOT READ ON! We slowly approach the large estate known as Xanadu. This estate is more like a palace. It belongs to Charles Foster Kane. As we approach Xanadu we begin to notice it's bizarre, eerie and exotic atmosphere. Wild monkeys climb up the walls. We slowly come closer to a large dark window. Through the window we can now see inside the dark depths of Xanadu. Cut to a close up of a snowy area. It's really a snow globe It falls and rolls against the ground and then shatters. Charles Foster Kane is sitting on his chair and finally...he takes his final breath and utters his last word "Rosebud...". What on Earth does 'Rosebud' mean? That's what a group of American reporters are trying to find out so they can publish a brilliant article that will be make their story stand out. 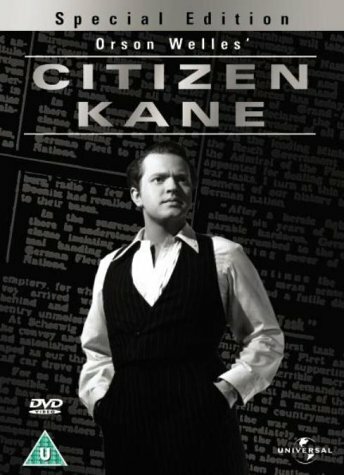 As one of these reporters go to talk to several people who were involved in Kane's life, he begins to learn all about Charles Foster Kane. Charles Foster Kane was a happy young child. He enjoyed playing on his sled in the nice winter snow. However his parents felt they could care for him properly, so they had him sent off to live with a rich man who could raise him for a successful future. As Charles grew up he decided he wanted to be a newspaper man. Kane's success was immediate. On one occasion, Kane went on a mysterious vacation and returned with a wife. As all successful newspapermen do, Kane turned to becoming a politician. Kane has all the odds in his favour, until one affair to remember. Charles in on his way home when he meets Susan. She is a young woman, with dreams of singing. Kane is enchanted by her. Sadly, a man working for the politician running against Kane discovers his relationship with Susan and threatens to publish it if Charles does not drop out of the election. Kane does as he's told and as his wife files for a divorce, Charles continues his romance with Susan. Susan and Charles are married. Kane's wealth brings Susan into a massive Broadway production. The musical is a flop, and Charles grows old and old. He moves to Xanadu, which is never finished being built. It's there Kane takes his final breath. So what was Rosebud? SPOILER ALERT! When we see Charles during his childhood in the begging, he is holding tightly onto his sled. Rosebud, was Kane's sled. SPOILER ALERT! The Good: What's there to say, really? We're talking about Citizen Kane. Most of the great aspects of the film have been mentioned above in THE FILM section. What stands out most about the film are the innovative camera angels. The Bad: Citizen Kane is a undeniable classic. However, it's slightly over-rated. The film is slow during the second half. As well, Dorthoy Comingore delivers a less than decent performance. But these slight quibbles aren't enough to make this a 9/10 movie. What's the real problem? Well, Citizen Kane suffers from letting me down every time I watch it. I always expect more from it. Citizen Kane always manages to disappoint me slightly each time I watch it. It's a personal quibble.